The third issue of The Researcher launches today. This digital publication, created for health researchers by health researchers, aims to raise awareness of research careers among nurses, midwives and allied health professionals. Created by Health Education England (HEE), NHS Research and Development North West (NHS R&D NW) and the National Institute for Health Research (NIHR), working with a team of ‘early career’ researchers and award-winning writer Rob Young, The Researcher illustrates the real-life stories of what it’s really like to undertake a research career. 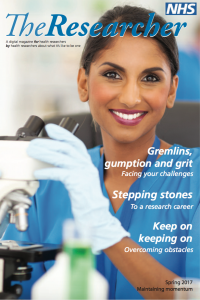 Following a successful first two issues in 2016 which have received over 10,000 views so far, this issue explores helping researchers ‘maintain momentum’. “I was really excited when I heard about the magazine – as someone taking the first steps towards a clinical academic career I felt that this would be something I would be really interested in reading myself! I’m really enjoying the Internship, and wanted to encourage others who might be thinking about applying to go for it. It can be quite daunting, taking the first steps into research, but I’ve really benefitted from hearing the stories from the other Interns and from Early Career Researchers who have shared their stories with us”. The Researcher is available to read on the HEE website: https://hee.nhs.uk/our-work/developing-our-workforce/clinical-academic-careers/researcher. Enjoy!